Located 20 kilometres from Seoul, you will find a retail wonderland, Shinsegae Starfield. Labelled a “theme park” for shoppers, the development was designed to attract all age groups by bringing in unprecedented experiences including a recreational sports arena, Sports Monster and Korea’s first Tesla store. With an investment price tag of $1.3 billion, the scale of this project is one of the the biggest Korea has seen. To get a feeling for size, the building takes up 460,000 square meters or approximately 10 soccer fields put together. It is home to around 300 stores, 750 brands, has 6,200 spaces for cars and is anchored by Shinsegae department store. The space alone is encapsulating and eye-catching with the architects optimising the natural light available to the space by using sweeping glass roofing. You gain a sense of calm when you enter the shopping centre and its design evokes a relaxed and comfortable feeling for your entire stay. Luckily enough because according to Time Out Seoul, “one day [at Shinsegae Starfield] is just not enough, no matter how fast you test yourself”. With these five crucial components of Future Food’s masterplanning model, we were able to achieve a creative and carefully curated hospitality masterplan that matched the expansive, experiential and elevated retail experience. The centre is complete with over ten thousand square metres of dining options with something for every palette. 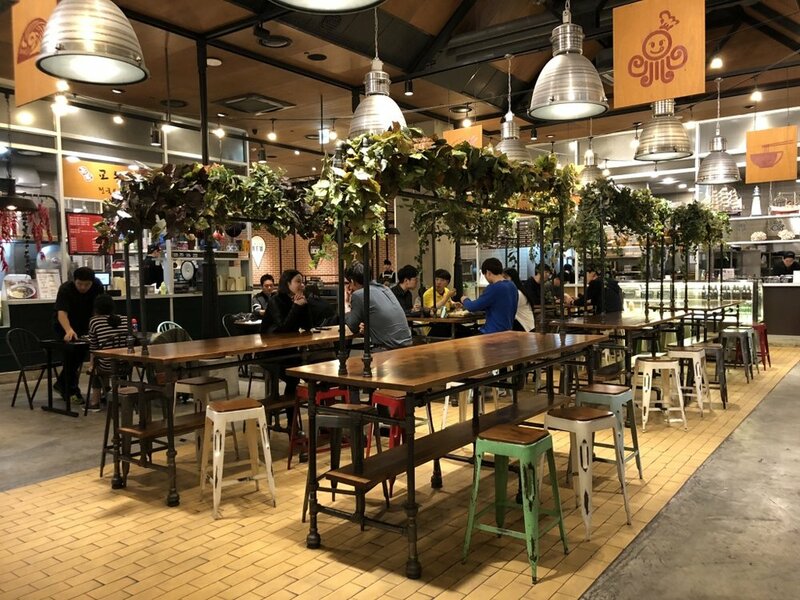 Gourmet Street, on the ground level of the shopping precinct, has 17 restaurants and cafes while the Eatopia food court offers more casual fare with 18 kiosks specialising in well-known local artisan eats. The food court area also features indoor/outdoor seating with views of the Han River and Gumdan Mountain. With a prediction for 12 million visitors per year, our team had to overcome the challenge of understanding the target customer groups within as well as the total market capacity versus the available space in order to gain maximum returns for all stakeholders involved. We did so with one core value considered every step of the way and that is to create for the customer. What has been created is a food and hospitality experience that compliments the retail aspect of Shinsegae Starfield and even stands alone as a reason to visit. There are high-end options as well as fast-casual eateries and everything in between to ensure the centre delivers something to every one of the 12 million customers that will come through the shopping mall doors time and time again. Future Food are pleased with the final outcome, not only of the food precincts but of the entire project. Shinsegae Starfield is one of the first of its kind in Korea and is a hallmark for the changing landscape of retail centres around the world as they shift into dynamic dining, shopping and entertainment destinations.